Owing to its diverse use cases, QR Code technology is popular worldwide. Countries like the UK, United States, Canada, Australia, and China use QR Codes. What about QR Codes in France? 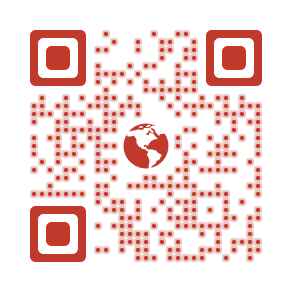 Statistics from 2013 show that QR Code penetration in France varied between 6.8% and 22%. 89% of the population know about QR Codes and 53% have scanned. Also see the latest statistics on global QR Code usage. The Fivory app allows users to make cashless payments at stores by scanning a QR Code. Besides this, customers can earn loyalty points using the app. French bank BNP Paribas owns Fivory. In Oct 2016, Fivory and Wa! announced a merger to create a “unified, universal mobile payment solution”. Wa! is an e-wallet owned by supermarket giant Carrefour. This new unnamed app with also support peer-to-peer money transactions. Customers at French retail giant, Auchan Retail, currently use the Fivory wallet app to make payments. By mid 2017, it’s expected that the unified payment app will be integrated into the myAuchan app. In 2016, French department store chain Printemps, partnered with Chinese e-wallet, Alipay. Using Alipay, Chinese shoppers in Paris could make purchases at Printemps. This move made Printemps the first department store to introduce Alipay in France. 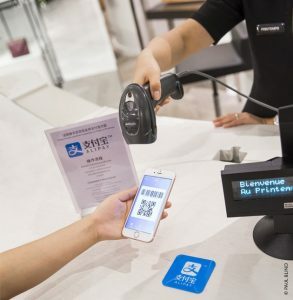 To make a payment, the shopper would need to scan a QR Code using their Alipay app. This saved a lot of Chinese tourists the trouble of carrying a lot of cash. In 2012, Carrefour introduced the Mon Panier service. This service allowed shoppers to buy groceries and make a payment online. Later, shoppers could pick up their groceries from the store’s kiosk. 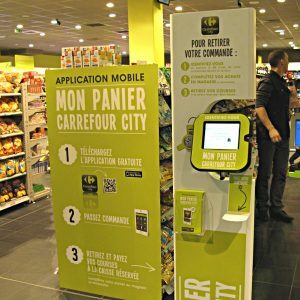 Once at the counter, the shopper had to scan the QR Code generated on the Mon Panier app. Scanning the QR Code with the QR Code scanner placed at the kiosk helped identify the shopper. In 2012, premium sports footwear company, Reebok, ran a QR Code marketing campaign. 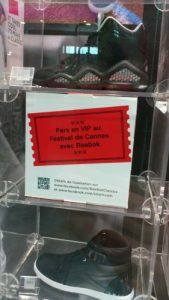 The campaign gave people a chance to win VIP passes to the Cannes festival. To register, people had to scan the QR Code and fill the registration form. 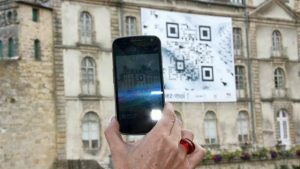 In July 2013, the castle of L’Hermine, Vannes featured a large QR Code. 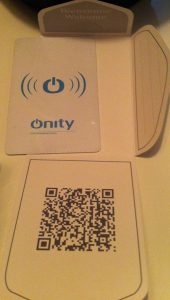 Scanning the QR Code led scanners to a mobile game. Besides the game, the QR Code also led scanners to the city’s page which detailed its history and culture. Within two months of installation, the QR Code received 6,000 scans. Installation of the QR Code led to a 30% increase in the city website’s traffic. 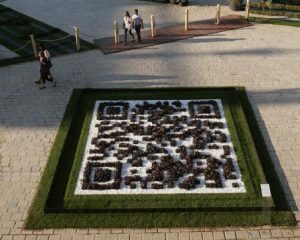 In 2011, the garden in Stanislas Palace in Nancy, France displayed the world’s first botanical QR Code. The QR Code, was added as a temporary attraction at the palace gardens during renovation. Built on an area of 40 square feet, the QR Code was made of several flowering pots. Scanning the QR Code directed people to a website listing the events scheduled at the palace. Branding cattle with QR Codes may sound funny but is quite practical for dairy farmers in France. In 2012, French Government passed a law, limiting number of billboards in certain areas. This in turn restricted marketing opportunities for dairy farmers. 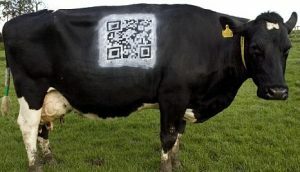 As an alternative marketing method, dairy farmers painted QR Codes on cattle. Painting cattle with QR Codes helps farmers maintain information and inventory process. Besides this, buyers could access extra information on the cow by scanning the QR Code. As a marketing gimmick, scanning some QR Codes also lead to a mobile game. Bookbeo, a mobile marketing agency in France designed the mobile game. In 2011, there was a similar use case in the UK. Cattle on sale at an auction were painted with QR Codes. 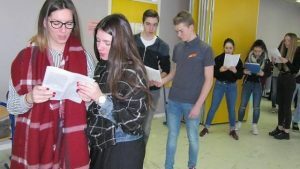 Elorn High School, in Landerneau, France uses QR Codes to bring poems and history to life. As part of a history circuit, the school takes students on a digital poetic ride. The school issued students a booklet with 10 QR Codes. Each QR Code gave information on one of the 10 historical sites across the city. The Best Western Hotel Le Montparnasse in Paris uses QR Codes to showcase room amenities. Each room has a brochure with a printed QR Code. Scanning the QR Code directs the guest to a PDF listing the hotel’s facilities. In March 2017, the French capital, Paris announced a 40% decrease in advertising space. This move will most likely see more print marketers opting for QR Codes. If you are a print marketer in France, do not miss out on this opportunity and start adding QR Codes to your campaigns.